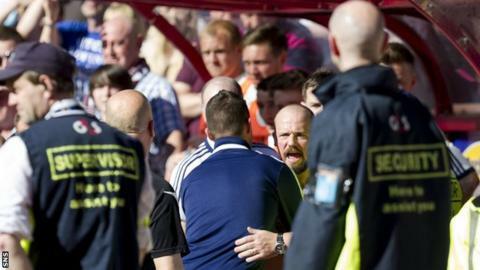 Hearts are to contest the notice of complaint issued to Jamie Hamill for his dismissal against Ross County. The 27-year-old was shown a second yellow card for clashing with County manager Derek Adams following his successful penalty in a 2-0 victory at Tynecastle. Hamill, who is accused of knocking Adams to the ground, missed the 2-1 Edinburgh derby victory at Easter Road. The hearing will take place at Hampden Park on Thursday, 8 May. Hamill is accused of breaking disciplinary rule 201 - which includes "any physical violence" - through "excessive misconduct at a match by knocking Derek Adams, manager of Ross County FC, to the ground".